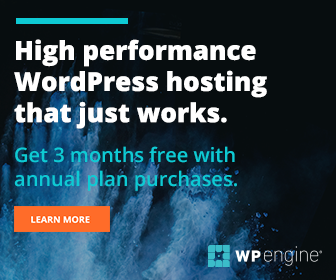 So you have decided you want to start sending out email newsletters and promotions and you have chosen MailChimp as the tool to do it. After reading this you will be able to get started with sending emails, including taking a ready-made MailChimp template and customising it to make it your own. Once you have set up your account you will need to make sure you have completed all of the sections. 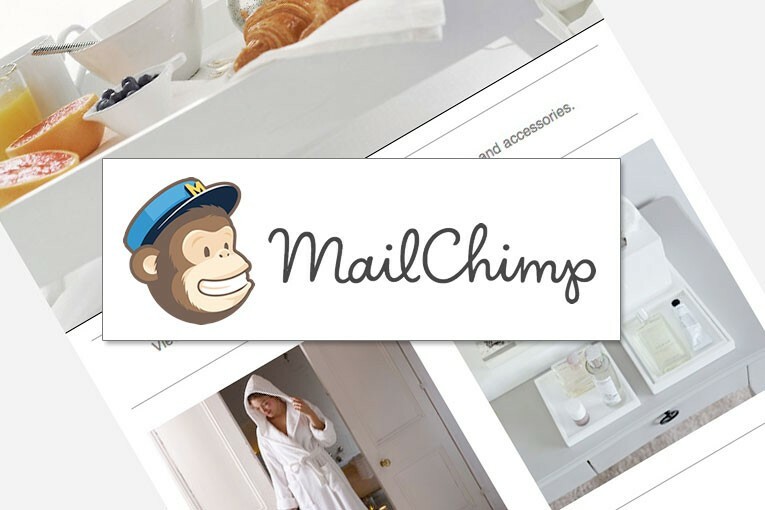 Your business contact information is very important, MailChimp will use this for your campaigns. 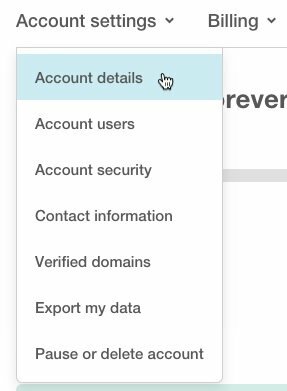 You will be prompted for this information when you set up your account but you can update it at any time via the account settings panel below. Click on Lists from the main menu. Then click on Create List at the top right of the lists screen. 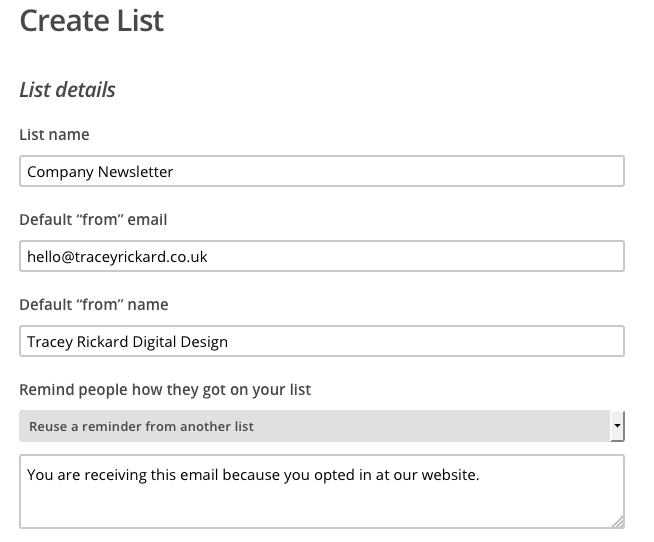 That will bring you to the MailChimp list details screen, you can see the example details I have added below. Once you have saved your new list you can start adding subscribers. You can either type or paste in subscribers one by one. Or if you want to subscribe more than one person at a time you can import a list via any of the methods below. 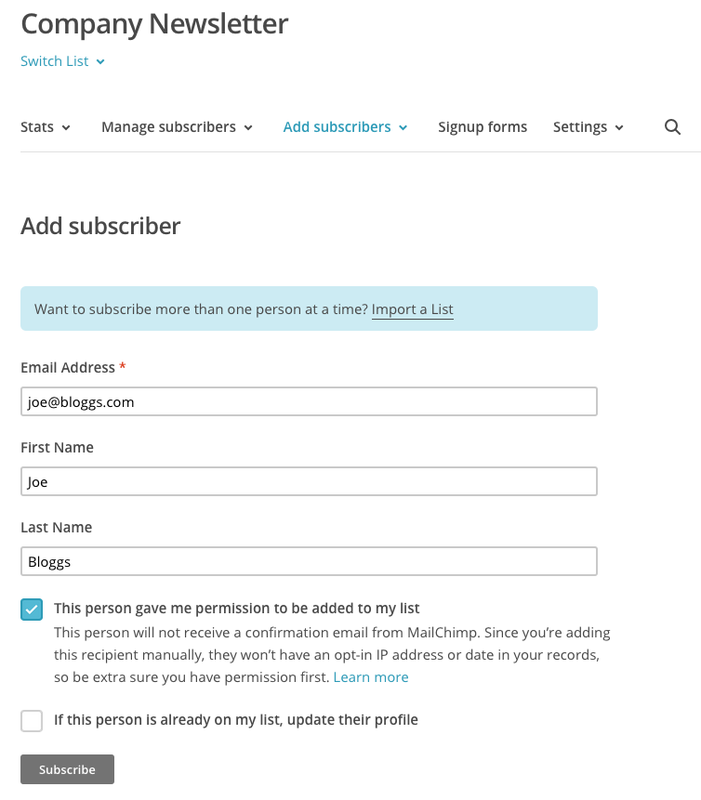 You can only import lists of people who sign up at your website, MailChimp is very strict with the law. No third-party lists, prospects, lists that you scraped from websites, chambers of commerce lists, etc. It is illegal to send unsolicited email to random lists of people. 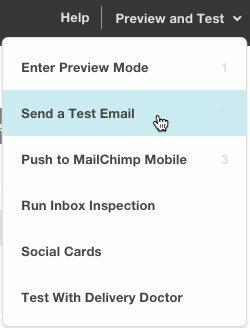 The MailChimp campaign builder is really easy to use. It walks you through each stage, step by step. Firstly it will ask you what sort of campaign you wish to create; for most users this will be a Regular Campaign. 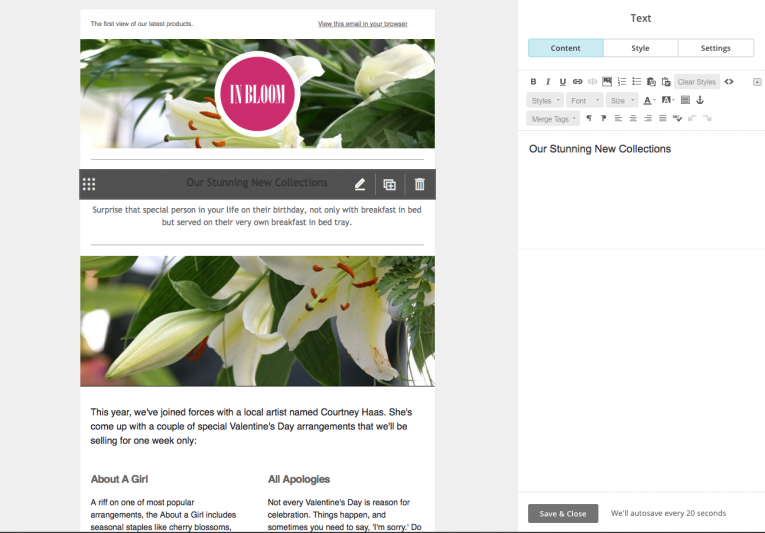 You can design and customize these emails, and choose whether to send them immediately or schedule them for later. 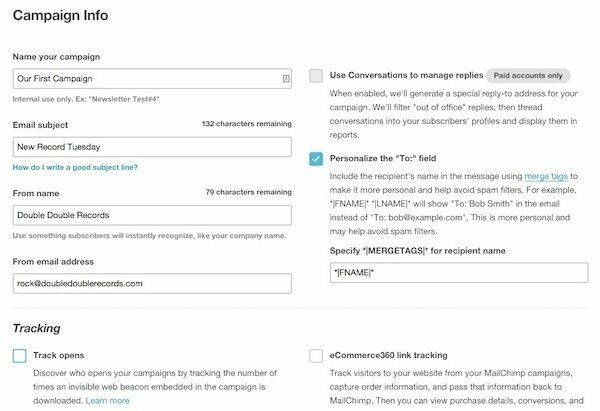 Note that a campaign is the name given to each email message sent to your subscribers. 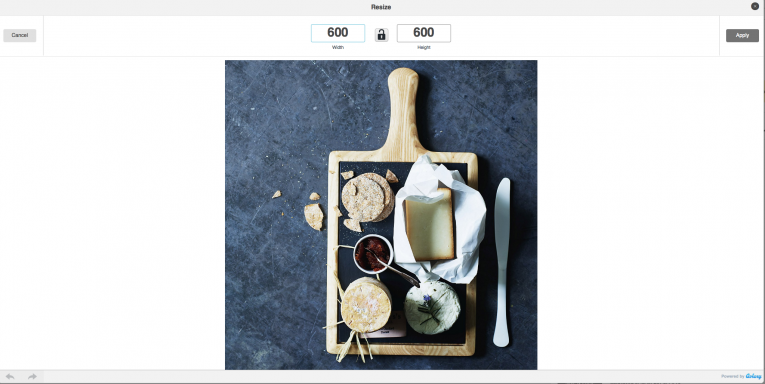 Templates are the files that determine the layout of your images and text to be used within your campaign. Step 1: Recipients – Choose the recipients who will receive your email. 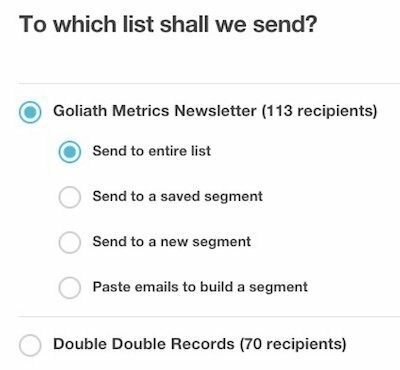 So select the list you wish to use. Step 2: Setup – you will input important details about your campaign. 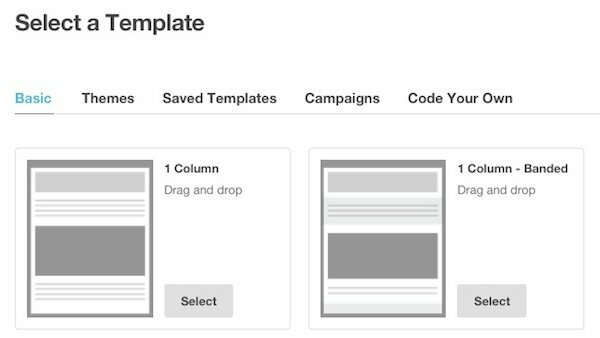 Step 3: Template – you can choose what template layout to use with your campaign. Basic templates are simple layouts. 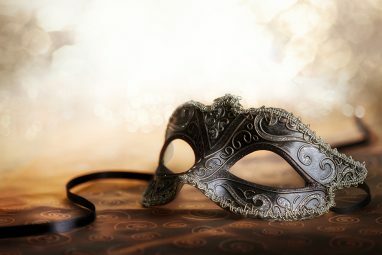 Themes include images and colour schemes. 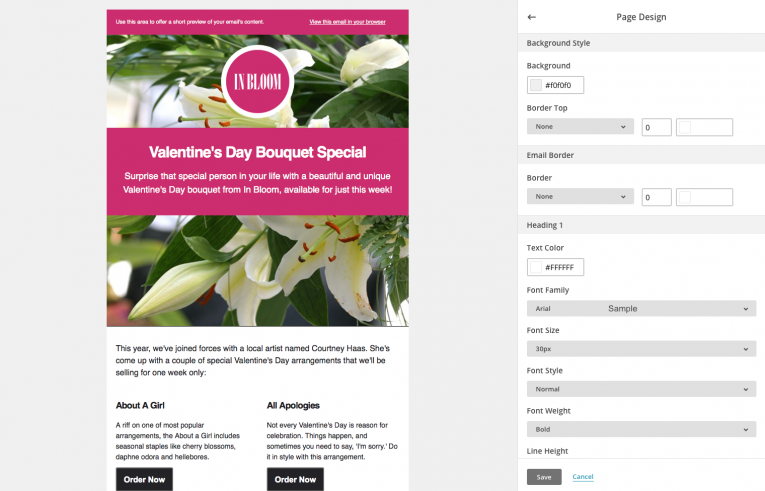 I will show you below how to take one of these MailChimp themes and customise it to make it your own. 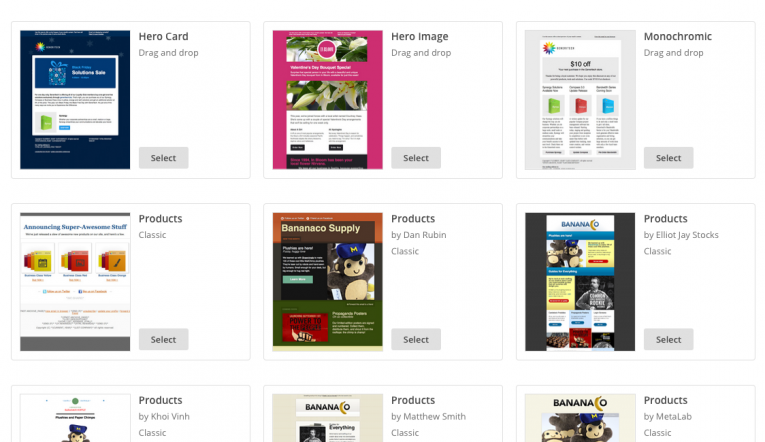 Code your own templates are really for web developers. 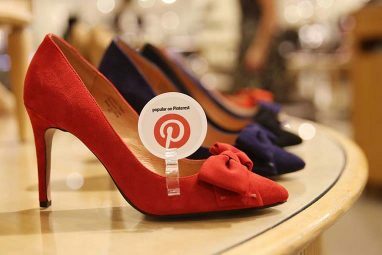 Step 4: Design – now you are ready to design your campaign and add your content. When selecting a template, make sure it is a drag and drop template. They are much easier to work with. Get something that is fairly close to the layout that you want to end up with. Ignore colours, they can be changed.  I started out with the Hero Image – bright pink template from the line up below. I liked it because of the image layout at the top …..
…. and I turned it into this, to suit the style of my pretend brand. 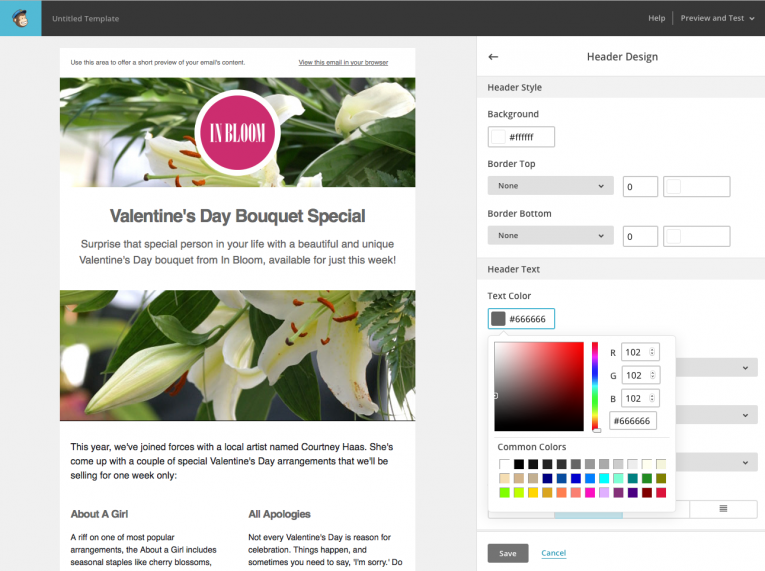 Once you select a template it will take you to the MailChimp template editor. Here I selected design from the tabs on the right and under that I selected the section I wanted to edit. 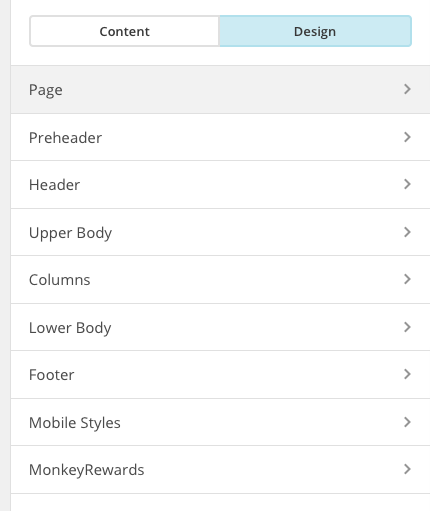 Below right you can see the MailChimp page design options. I changed the background colour to a very pale grey. I also scrolled down and changed all of the text colours for the headings to grey. Below you can see the background colour and the selection tool for the text colour under the Header Design. I changed the background to white, the text to grey and the link text to grey. Remember to change the link text to your preferred colour as well as the main text. Links can be a different colour to the main body text if you wish them to stand out. I changed the background to a medium grey and the text and link text to white, just to provide some contrast. By hovering your mouse over one of the content blocks you will get an option to click on the pencil icon for that particular block to edit it. You can see the editing icons below the main image and the block editor on the right. You do all of your editing over in the right hand panel. Here you can change the content and the style. So you can change the font family, the text size and many other things just for that content block. Here you can see I have updated the text content in the preheader and header. I have also changed the font family to Trebuchet and changed the sizes. Then I changed the main images. Easy to click on the pencil and then click on replace on the right hand side to add an image of your own. If your image is the wrong size, MailChimp will give you a warning as highlighted in orange below. Click on ‘Let’s fix it’ and you will be able to resize to MailChimp recommended sizes as I have done below. You can see the dimensions I have set in the 2 boxes at the top. 600 x 600. These dimensions are always in pixels. I have also dragged in dividers (dividing lines) to frame the top and bottom of my text. The default dividers will usually be OK for most light backgrounds. 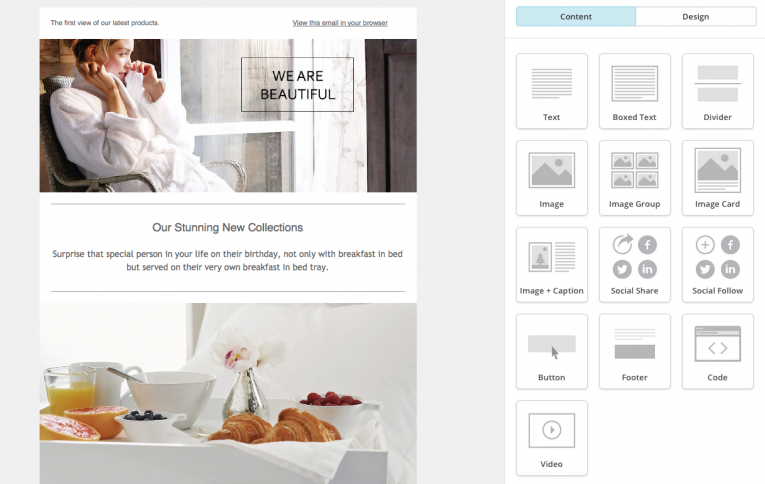 On the right are all of the content types that you can drag and drop into your template to use. For the lower content blocks I wasn’t so keen on the layout. All very easy to change with the drag and drop interface! First of all I deleted the existing blocks by hovering and clicking on the dustbin. Then I dragged in an image group. You can have up to 5 images in a group but I am just having 2. Then I added another divider, a text block and a further divider. 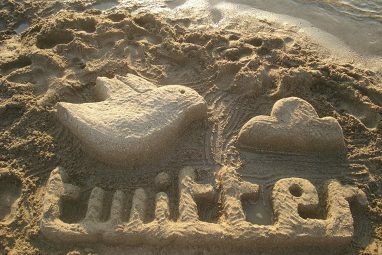 Lastly another image block, exactly the same as the one above. Finally I added a button, a call to action to visitors to go to my online store. When you create a button you are able to style it and add text. You also add the website link for the button. It is very important to know what you want to get out of your email, then you can add the appropriate call to action or (CTA). Here is my completed template. You can preview and test your campaign at any time. The final step shows all the choices you have made. The list will highlight anything that still needs attention. If everything looks good you can click send to start sending straight away or click on Schedule if you plan to sent at a better time. The reporting section within MailChimp is very comprehensive. You can get information about your campaigns including who opened and read your email, or who clicked on a link within your email. You can get general stats like the report below or drill down to view the behavior of individuals on your list. That’s all folks! 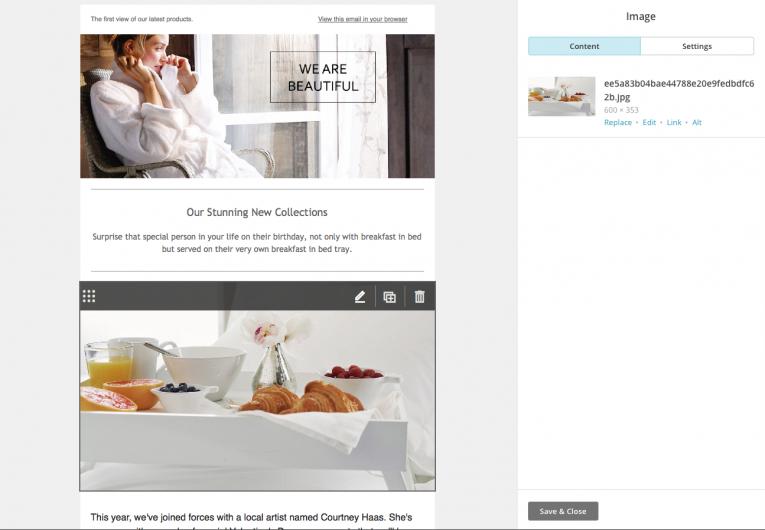 MailChimp is such a fabulous interface, so easy to use. 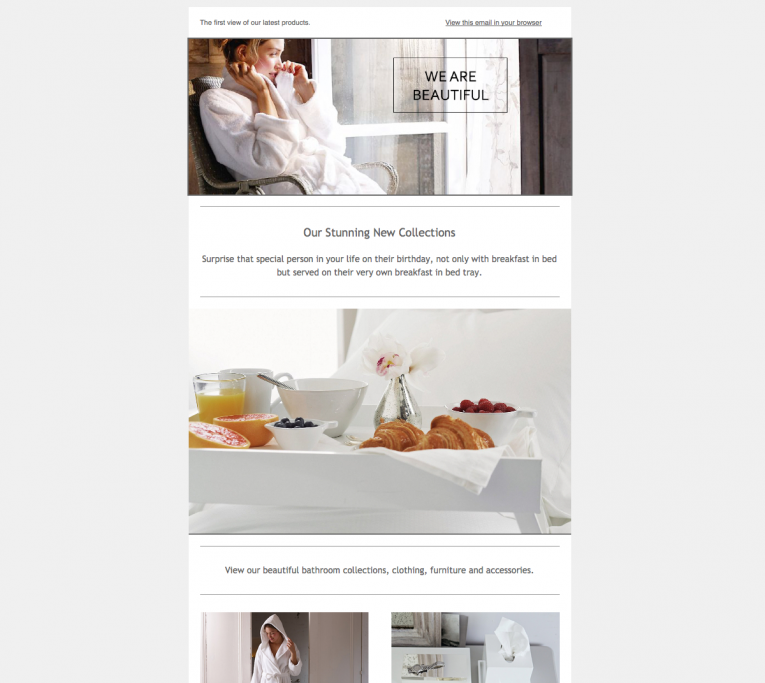 You will be up and running with highly professional email campaigns in hours.